The date of the Vernal Equinox and of astronomical spring in the northern hemisphere (the official start of spring) falls on March 20th this year. This is when the Sun's path (‘the ecliptic’) first crosses the celestial equator on its apparent journey northwards into the sky.  The orientation of the Earth at the spring or autumnal equinox is such that neither of Earth’s poles are inclined toward the Sun and all locations experience equal hours of daylight and darkness; hence the term equinox. The Vernal Equinox is also known as the 'First point of Aries', as the Sun used to stand before the constellation of the Ram when it first crossed the celestial equator. Although still called the 'first point of Aries', today its location now resides in Pisces, a consequence of the effect known as precession - the Earth's slow wobble Over thousands of years our ancestors noted that certain star patterns rose just before the Sun at specific times and were considered significant for this very reason. Subsequently they were able to build a picture of the apparent path of the Sun against these constellations. The narrow path upon which occasionally the Sun and Moon would meet giving rise to an eclipse, became known as the Ecliptic. The broader belt along which the 'wandering stars' or planets travelled was known as the Zodiac, so called because all 12 constellations located on it were associated with living creatures. Zodiac literally means 'Band of Animals'. Libra used to be considered being part of Scopius, the claws to be precise. Ophiuchus, the serpent bearer immediately following Scorpius was instead regarded as a zodiac group. Ever since the stars of Libra were elevated in status, Ophiuchus, being surplus to requirements, was ditched, much to the relief of astrologers. If you find it difficult to remember the order of the zodiac constellations, then the following rhyme may be of use. The Virgin, and the Scales.